This 1982 FJ43 was fully restored and customized for a client in Madison Wisconsin. A former farm truck was the foundation for this cool classic ride, built for quick sprints around town and the occasional highway drive. 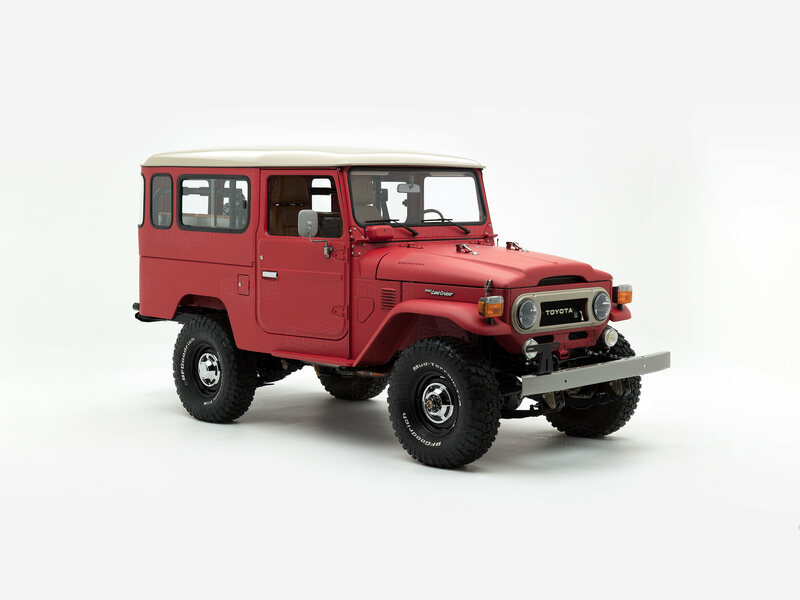 The jaw-dropping look of this Land Cruiser with its custom matte red finish and classic details is bound to have a dedicated following in the college town of Madison, Wisconsin, where red is more than a color. Look beyond this bold finish, and you’ll find a Land Cruiser rebuilt in the spirit of the original, with the same iconic grille and badging, classic vents and exposed bolts. Classic sheet metal riding on four 33-inch tires, eager to go wherever the journey takes you. For many Land Cruiser enthusiasts, the 40 series experience is more than a look, it’s a feeling. One that isn’t lost on this FJ43. Look under the hood, and you’ll find the fuel injected Toyota 1FZ, a 210-horsepower engine with that cool classic sound. And of course, we made all of the serious upgrades that make this 4x4 safer and more comfortable to drive, features like a 5-speed manual transmission, Old Man Emu suspension, front disc brakes, and Advanced Power Steering. Get behind the wheel of this classic Land Cruiser to experience premium handcrafted details and classic controls. It’s a trip through memory lane that every enthusiast longs to take, one made all the more comfortable with custom leather upholstery and lumbar support. It’s a cabin that makes you long for the nostalgia of the past, while modern amenities summon up the perfect temperature and your favorite playlists, without breaking the spell. With a 1GR-FE engine and other modern upgrades, the G40 Expedition by The FJ Company is revved up and ready to take on your next daily adventure. Customize yours!